As you can see above, TMZ has obtained video from the set of Mission: Impossible 6, and the footage features Tom Cruise getting what looks like a pretty extreme ouchie. 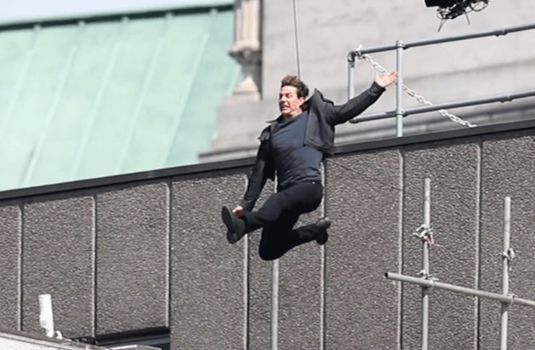 We don't know the context of the scene for which the stunt was being performed, but the set-up necessitated Cruise to jump from a platform over to a roof top while filming was commencing in London. Unfortunately, it looks like he fails to leap far enough, and instead he winds up clinging to the side of the building. He is ultimately able to pull himself back up, but he can clearly be seen limping after the accident. The wire team then has him fly back to the platform before the video ends, but one can guess that he didn't immediately give the leap another shot. We definitely don't want to make light of the accident, and we hope that Tom Cruise can recover quickly from whatever happened to his leg - but it's also hard not to see the irony in this. As mentioned earlier, this is a guy who actually strapped himself to the side a real airplane as it was taking off eight times for the production of Mission: Impossible - Rogue Nation, and he walked away from all of that without a scratch. In comparison, you'd think leaping across buildings would be a piece of cake for the actor, but at the same time it also demonstrates the real danger that is involved in stunt work (and also goes a long way in explaining why most productions don't let their stars do their own stunts). Until we have more details about what exactly happened here, we won't know how it will wind up effecting the production of the untitled Mission: Impossible 6. If it's merely a sprain, it may not be too long before he can start functioning somewhat normally (they may have to rearrange the shooting schedule a bit). If it's a break, it may take a bit longer. The film is currently scheduled to come out in less than a year, so we'll have to wait and see if it becomes a big enough issue that a release date shift is necessary. The second sequel in the series to be written and directed by Christopher McQuarrie, Mission Impossible 6 is set up to be another big time globe-spanning blockbuster that feeds more into the series continuity than any sequel before - featuring returning stars Rebecca Ferguson, Michelle Monaghan, Simon Pegg, Ving Rhames, Sean Harris, and Alec Baldwin. Meanwhile, new additions include Henry Cavill (as the central villain) and Angela Bassett, which isn't too shabby either. Paramount is scheduled to have the blockbuster in theaters on July 27, 2018, and we will keep you updated with further developments about the project.